Discussion in 'Tutorials & Resources' started by Shmitz, Mar 26, 2008. 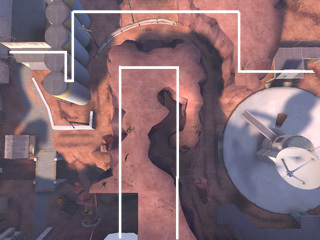 This tutorial aims to be a guide to basic visibility control using the structure of your map. 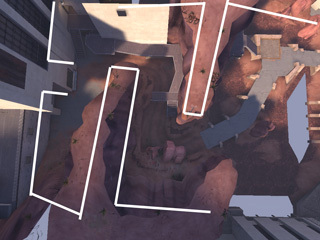 Visibility is what players are able to see from any given location, and thus what the game has to render. While an in-depth understanding is not needed for this guide, it helps to know how the game uses these invisible regions to determine visibility. Let's assume you are standing in visleaf A. If any point in A can see into visleaf B, everything in B is considered visible, and is rendered. The exact spot you're standing is less important than the general area in which you are standing. Notice the red line representing visibility, and how every room can see every other room. That's probably fine, because in a small indoor area, it's likely that there's not going to be enough detail or enough players running around to cause any performance issues. However, let's pretend those three squares aren't rooms inside a building, but distinct areas of action of a much larger scale. There may be buildings, boulders, cliffs, bridges, and other objects in those areas that provide a framework for the action, but for the most part it's an open space where you can easily see everything in that area. Now when we look at that red line we see a situation where three very busy, complex areas can all see each other, and so are all being rendered at the same time. That's bad news for most computers. Now we see that the left area can't see the bottom area and vice versa. They each can only see the middle. However, standing in the middle you can still see both, so there's still the potential for performance problems. 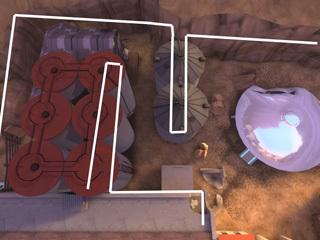 So instead of just making the connections longer, we want to bend them a bit to play with that line of visibility. If you're in the left area, you'll only be rendering a small amount of the right area. If you're in the right area, there's only a small section where you will be rendering both areas. You can further improve performance by using an areaportal in the hallway, if possible. The benefit of carefully controlling player visibility is not just in-game performance. By using the map's structure to limit visibility from one significant area to another, you can also drastically decrease vis compile time, because you're decreasing the complexity of the bsp tree. I knew the basic stuff, but it's really helpful to have some clear examples . I have read much on optimization (including the bible by zombie) and this is probably the clearest explanation and examples of using layout for vis blocking. Great job. I didn't even know about the pyramid hint brush which I think would be useful for me since I didn't use a layout like yours with the use of walls to block in between. QUESTION: Why is it best to use diaganol hints instead of just horizontal or vertical like in a doorway? QUESTION: Why is it best to use diagonal hints instead of just horizontal or vertical like in a doorway? Though there are several tutorials that cover this question more thoroughly, it's still relevant to basic visibility, so let's approach it from that angle. The compiler is pretty dumb when it comes to cutting up your map into visleaves. All it really knows how to do is follow the lines of your map, which are, most of the time, going to be horizontal (x-axis) or vertical (y-axis). However, visibility just doesn't happen strictly along the X and Y axis. It's like looking through a porthole on a ship. The farther away from the porthole, the more you can see. You might see a vast island in the distance, but you don't see the secret agent crawling up the side of the ship. In other words, visibility acts on a diagonal, depending on what hole you're looking through. 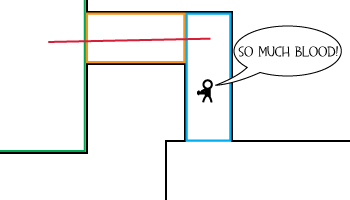 Our Heavy is sitting there in the hallway, but from where he's standing, he can't actually see around the corner into the room outlined in green. The game thinks he can, though, because you can draw a straight line from the blue visleaf he's standing in to the green one. So we're actually creating an extra visleaf or two when we do this. However, we are also minimizing when both rooms get rendered to when the Heavy is standing in that small purple corner of the hallway. When he's in blue, he can't see into the room on the left. When he's in orange, he can't see into the room on the bottom. When you say "erring to the outside of these bounds", is that what you mean when I see the hint brushes in the pics extending past the doorway and into each of the rooms? Basically, you can consider a visportal to be a window. When inside a visleaf, the portals (faces of the 3d area you reside in, cut by the vbsp during compile) dictate what can be seen, and thus rendered. Not what your screen is simply seeing. By using diagonal hints, you refrain one visleaf from seeing another along a 180 degree plane. the plane (at the top of the blue visleaf) can see the green visleaf, (imagine you were standing on that plane). This room will be rendered from the blue visleaf, where ever you are inside it. I tried not to reitterate what was said but maybe that is somewhat more explanative of the situation regarding horizontal/perpendicular visportals/visleaves. In this case, the "1" dotted lines are the two places where hint brushes would be placed to create the visleaves in my previous examples. However, you could go all the way out to the "2" dotted lines and still effectively block visibility around that corner. If you place them at "1" you minimize the area in which both rooms are rendered. At the same time, however, the Heavy is rendering the entire hallway from where he's standing. 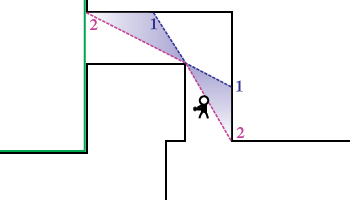 If you place them at "2", the two arms of the hallway can't see each other, but you've created a larger area in which both rooms are being rendered. Since you can place your hints anywhere between the 1 and 2 positions, a happy middle ground is usually a straight line that touches that corner. Which is better depends on a number of factors including how detailed your "hallway" is and where the most important place to limit visibility is. As mentioned previously, this tutorial does not aim to explore the depths of ideal hint placement, but it's always good when laying out your map's structure to have some idea of what your hint options will be.